If you've been on Facebook over the long holiday weekend, you might've seen posts promising 500 lucky people the chance to win a year's worth of free flights on Virgin Airlines — and for a chance to win, all you have to do is “like” a certain Facebook page and “share” a certain Facebook post. Don't do it. There are no tickets, there won't be any winners, and Virgin Airlines didn't create that Facebook page – it's nothing but the latest attempt at a “like-farming” scam. Like-farmers start pages and fill them with content dedicated to collecting as many “likes” or “shares” as possible in the shortest amount of time in order to drive up the page's popularity ranking. Once the page rank is high enough, the like-farmer removes the original page content and replaces it with anything from ads for scam products to dangerous malware infections — or outright sells the page to another scammer on the black market. Anytime you see a Facebook post with such phrases as “Like and share if you agree!” or “Like and share to win a valuable prize!” it's almost certain to be from a like-farmer seeking to drive up his popularity rank. 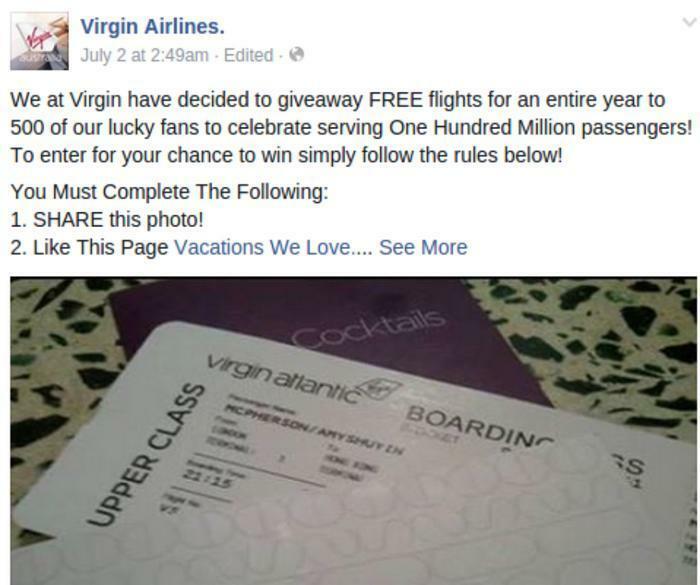 And this alleged Virgin ticket giveaway is no different. The post is from a Facebook page named “Virgin Airlines.” — with a period at the end of the name. That alone is enough to indicate a fake page. Like-farmers often (though not always) use unnecessary punctuation to distinguish their page name from an already existing one. So if you see page names such as “Walt Disney World.” or “Six Flags.”, you can safely assume the real Disney or Six Flags companies aren't behind those pages. We at Virgin have decided to giveaway FREE flights for an entire year to 500 of our lucky fans to celebrate serving One Hundred Million passengers! To enter for your chance to win simply follow the rules below! 2. Like This Page Vacations We Love. Winners will be contacted on July 8, 2015! But the scammer behind that post is trying to fertilize two Facebook like-farms, not just one. After all: in addition to sharing the “Virgin Airlines.” photo, it also tells you to visit and “like” another page called “Vacations We Love.” (again with a period at the end of its name) and leave a “thank you” in the comments. But you'll see no such discussions on “Vacations We Love.” There's only one post on the page – a notification that the page updated its cover photo. That photo (and post) shows an airplane landing at sunset, overlaid with the phrase “KEEP CALM AND FLY TO YOUR LOVE” – and the 1,400 comments on that thread aren't people talking about their vacations, merely people posting the words “Thank you” over and over and over again. That collection of repetitive, non sequitur comments is another sign indicating that a Facebook page is actually a like-farm. Even if you're not familiar with like-farming scams, and unlikely to notice such subtle cues as unnecessary punctuation, you should still bear in mind the classic anti-scam rule “If it sounds too good to be true, it is.” The idea that anybody – let alone 500 different people – could win such a valuable prize by merely clicking on a couple of Facebook icons sounds too good to be true.